As we did the previous Friday, we bring you a new recipe which is quick and easy to prepare. 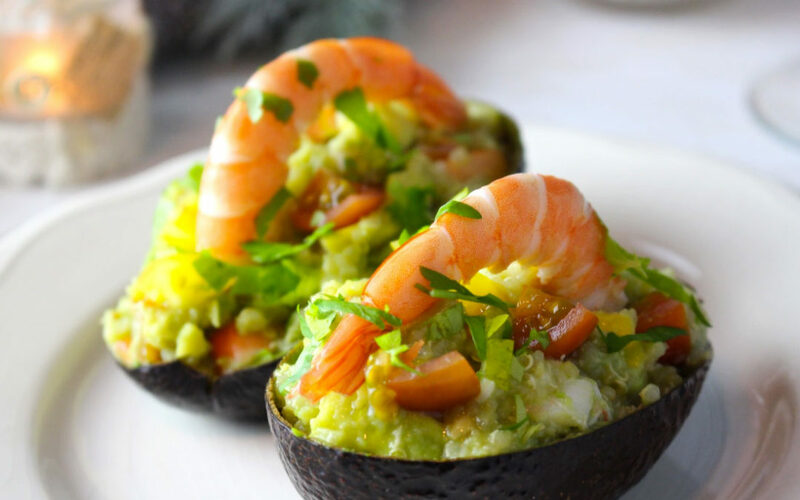 These are avocados stuffed with quinoa and prawns. This is a recipe from Orielo’s Kitchen, who we recommend if you are lactose intolerant. In his blog you will find a big amount of lactose-free recipes that you can enjoy without worring. Ingredients for avocados stuffed with quinoa and prawns. 100 gr of cooked quinoa. This recipe is designed for 4 servings. So if you plan to do more, you only need to increase ingredients according to the number of people. As we already told you in the previous recipe of quinoa salad with lemon and Echinac extra virgin Olive Oil, quinoa is a food very rich in fiber and proteins. This new recipe also contains avocado, an aliment which is rich in healthy fats that helps you to regulate cholesterol and makes it in a great antioxidant. It is a very healthy recipe. Wash the quinoa: You should wash the quinoa very well before cooking it. Ifit is not washed properly; it usually gives a bitter taste to the food. Put Echinac olive oil in a saucepan: In this hot saucepan with a little trickle of Echioliva, we need to stir the peeled garlic. Then, we add the quinoa and stir it for 1 minute. Heat the vegetable stock: On the one hand quinoa, you will need 3 parts of the hot vegetable broth. We add salt and we leave the quinoa cooking for about 15-20 minutes. Put the quinoa to a bowl and let it cool. Remove the pulp from the avocados: You will need to remove the pulp from the 4 avocados and preserve the skin, which we will use as a container. Crush the pulp of the avocado: Once we have thoroughly mashed the pulp of the avocados, we mix it with the chopped cherrys, and also with 6 or 8 cooked peeled and chopped prawns, and then add the quinoa that we had left cooling. Season: We need to add salt, extra virgin olive oil or Extra Ecological Echinac to the food we have already prepared and mix everything very well. . Fill the avocados: We need to take the skins that we had left aside, and then fill them and put on top a peeled shrimp to decorate it, except for the tail. Serve it and enjoy it: Finally, sprinkle the chopped parsley, add a little extra stream of Echinac Extra Virgin Olive Oil and …. you just need to serve it! Easy, right? It is very tasty and also it is very useful as starter in a gathering, like next Christmas. Oh! If you want another tasty recipe, do not miss the vegetable lasagna with carasau bread. What do you think about stuffed avocados? Have you ever prepared avocados stuffed with something else? Tell us in the comments beneath. And remember that at Echinac we are experts in quality olive oils since 1964. Discover all our products in the store. Information and image: Orielo’s Kitchen recipe.